Swimming is an activity that can aid weight loss. The U.S. Masters Swimming website notes that swimming has the added benefit of providing a total cardiovascular workout. How long you'll need to swim to get thin depends on your weight, how fast you swim and the swimming stroke you use, according to personal trainer Alice Burron, M.S., an exercise physiologist and spokesperson for the American Council on Exercise. Because 3,500 calories equals one pound, you'll need to burn 3,500 more calories than you take in to lose one pound, according to the Centers for Disease Control and Prevention (CDC). Cutting 500 calories from your daily diet would do the trick. But exercise, along with cutting calories, will accelerate weight loss. The CDC recommends at least two hours and 30 minutes of moderate exercise, such as swimming, per week. After you reach your weight loss goal, regular swimming will help maintain your weight. The National Weight Control Registry, a database of people who've lost an average of 66 pounds and kept it off for at least five years, reports that 90 percent of people who successful lose weight exercise an average of an hour a day. Finding a physical activity you enjoy, such as swimming, is important because you're more likely to do it consistently, resulting in weight loss. The CDC states that a 154-pound person burns around 510 calories by swimming laps for an hour. If you don't change your diet, you'll need to swim laps for about seven hours to lose one pound. The more you weigh, the more calories you'll burn. If you weigh 200 pounds, you'll burn around 637 calories by swimming laps for a hour while a 240-pound person would burn around 763 calories during an hour of swimming laps. Because swimming uses virtually all of the body's muscles, it can erase just as much body fat as land-based exercises. In a University of Utah study comparing exercise in water to walking on land, overweight women who swim four times a week for 40 minutes slim down just as much as women who walk the same amount of time at the same intensity level. Different swimming strokes burn different amounts of calories, influencing how long you need to swim to lose weight. If you want to get maximum calorie burn for the time you spend in the water, use the butterfly stroke. Burron says this difficult stroke, which uses a dolphin-like kick and windmill arm motion, will burn around 150 calories in 10 minutes for a 160-pound person. After the butterfly stroke, the freestyle stroke, also known as the front crawl, burns the most calories, according to Burron. "Because the freestyle is the easiest swimming stroke, it's the most popular one used for fitness and weight loss," Burron says. The breaststroke and backstroke are other swimming techniques that burn lots of calories, equivalent to a fast walk or slow jog for the same amount of time. The more you swim using a particular stroke, the faster you'll improve your technique and the more calories you'll burn. To up your calorie burn and lose more weight, Burron recommends interval training. Swim as fast as you can for a lap, then swim the next lap at a more relaxed pace. By increasing your workout intensity, even if only for short spurts of time, you'll increase the calories burned and raise your metabolic rate so you'll continue to burn calories even when at rest, Burron notes. Consider wearing a bathing cap. "It will reduce resistance in the water, allowing you to increase your swimming speed and burn more calories," Burron says. The U.S. Masters Swimming website recommends using a variety of strokes to break up your routine and help avoid boredom. Try using fins, hand paddles and kickboards to add variety to your water workouts too. Start slowly and gradually increase your endurance until you can comfortably swim for 10 to 30 minutes without stopping to rest. 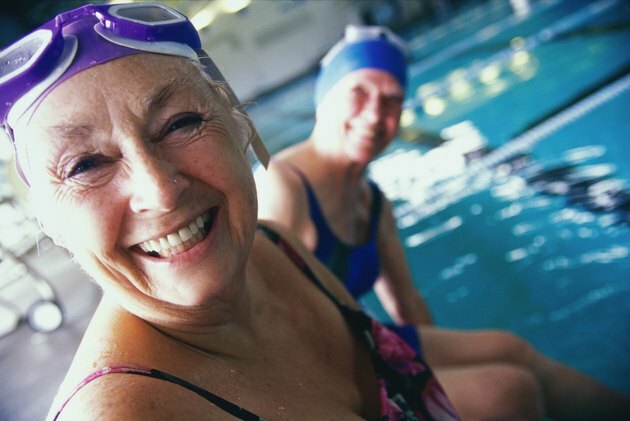 If you swim regularly, you'll soon reach your weight loss goal and see a slimmer you. Journal of Sports Medicine and Physical Fitness: Aerobic Exercise in Water Versus Walking on Land: Effects on Indices of Fat Reduction and Weight Loss of Obese Women.